This swirling landscape of stars is known as the North America Nebula. In visible light, the region resembles North America, but in this image infrared view from NASA's Spitzer Space Telescope, the continent disappears. Where did the continent go? 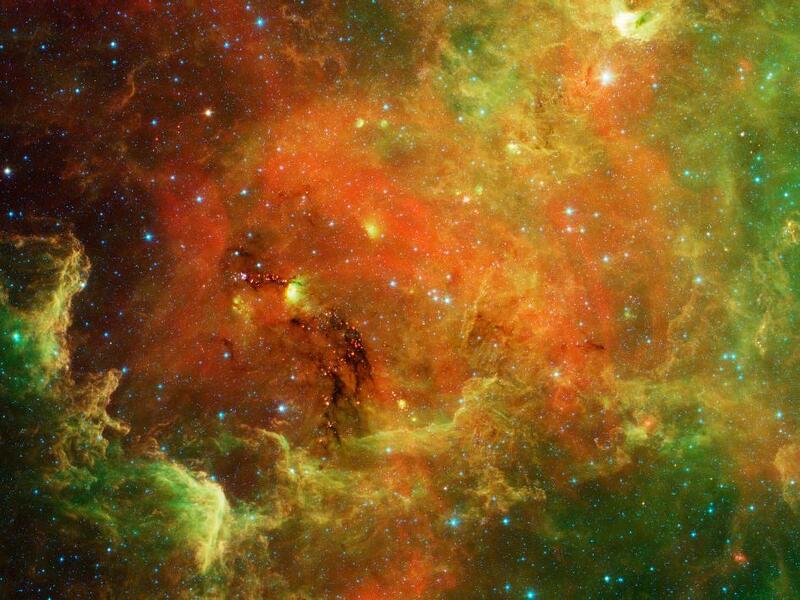 The reason you don't see it in Spitzer's view has to do, in part, with the fact that infrared light can penetrate dust whereas visible light cannot. Dusty, dark clouds in the visible image become transparent in Spitzer's view. In addition, Spitzer's infrared detectors pick up the glow of dusty cocoons enveloping baby stars. Clusters of young stars (about one million years old) can be found throughout the image. Some areas of this nebula are still very thick with dust and appear dark even in Spitzer's view. The Spitzer image contains data from both its infrared array camera and multi-band imaging photometer. Light with a wavelength of 3.6 microns has been color-coded blue; 4.5-micron light is blue-green; 5.8-micron and 8.0-micron light are green; and 24-micron light is red. This image is from February 2011.